It was more than 10 years ago that Tim and Danielle Bennett’s home was destroyed by Hurricane Katrina. Since then, the Pearl River, Louisiana, couple and their four children have lived in a shelter, a tent and a FEMA trailer. 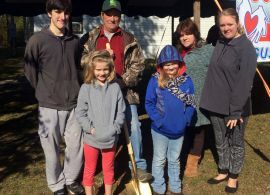 But thanks to the Ginger Ford Northshore Fuller Center for Housing and a grass-roots group called Compassion Pearl Rive, family will soon have a simple, decent home. Check out the report from the Times-Picayune of New Orleans.